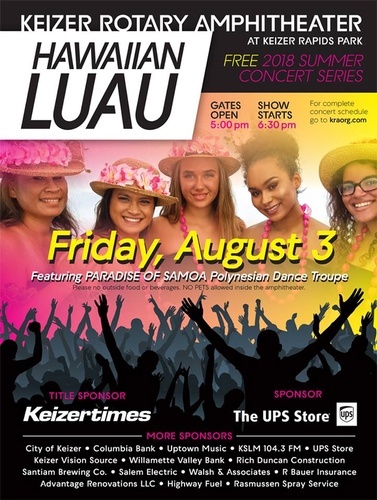 Keizertimes presents a Hawaiian Luau on Friday, August 3 — featuring Paradise of Samoa as part of the Free 2018 Summer Concert Series located at Keizer Rotary Amphitheater at Keizer Rapids Park. Gates open at 5 p.m., show starts at 6:30 p.m. Beer, Wine, & Spirits available from Santiam Brewing Co. Please no outside food or beverages. No pets allowed inside the amphitheater.